This entry was posted in TREK to the MANGER and tagged Advent, advent devotions, Bible study, Brita Hammit, Christian devotions, Christmas, devotional, small group study, trek to the manger, Women's Devotions, women's ministry by Pink Shoes Ministries. Bookmark the permalink. Yes, Judy! The book has not changed, and a new reading schedule is available here – on the blog site – for 2015. I hope to have small group discussion questions available here by next week as well, as a free download for groups who are “trekking” together! 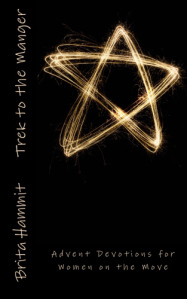 I haven’t announced it yet, but Trek to the Manger is also available on Kindle through Amazon (as of yesterday)! I’m so happy my SVPC sisters will be journeying together again this year!